Honoring the memory and extensive work of Prof. Dr. Fuat SEZGIN in the field of History of Science, 2019 has been declared “Prof. Dr. Fuat Sezgin Year of Science of History” where numerous programs and activities will be held in this scope throughout the year. 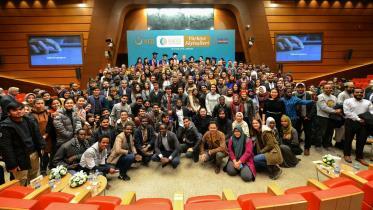 As Türkiye Scholarships, the “Prof. Dr. Fuat Sezgin History of Science Scholarship Program” will be open for candidates who wish to study at Bachelor’s, Master’s and PhD levels as well as Research (PhD candidates at thesis stage and post-doc) in the field of History of Science with special focus on History of Islamic Science. Candidates applying at Bachelor's, Master's and PhD levels are welcome to apply between the dates 15 January – 20 February 2019. Research applicants can apply throuhout the year. Two additional bonus awards will be granted to successful scholarship holders within the period of their study. As part of 2019 application and evaluation process, in order to facilitate and quicken the later stages of your admission, although it is not compulsory, all candidates planning to apply this year are strongly advised to make their application with a valid passport as their personal or identification document, or at least hold and present a valid passport during the scholarship interviews.